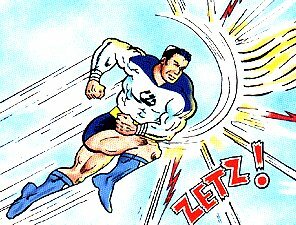 Powers/Abilities: Superstrong, invulnerable to undefined degree, doesn't need to breathe. Able to fly, going fast enough to create vortexes or to get into orbit. Possesses a variety of enhanced senses including "sensor vision" which appears to be a combination of night vision and telescopic vision, and enhanced hearing, capable of distinguishing specific sounds from the hubbub of the entire world, even when flying in orbit (let's not get into the sound-vacuum business). History: Shaloman is an apparently mystical being who normally takes the form of a stone carving of the Hebrew letter "shin" sitting atop Mount Israel. When something threatens the safety of innocents he can be invoked by their cries for help, transforming into the heroic form of Shaloman. 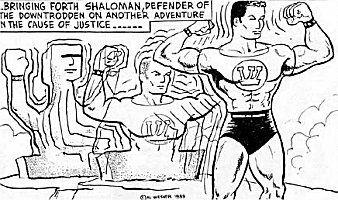 Comments: Created, written and drawn by Al Wiesner, who wanted to create a positive Jewish superhero role model, feeling that there was a lack of them in comics. 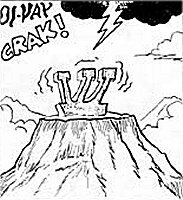 There have been around 30 issues to date, with Wiesner self-publishing the title about twice a year. The symbol on his chest is the Hebrew letter shin. Shalomboy was a young boy who was injured in a bus crash, and had his limbs replaced by bionic ones. He first appeared in Shaloman: The Miracle of the Lights.